An exploration of greed, futility, and extinction. Two ‘mermaid’s crowns’ on an illuminated plinth, antique opera gloves, and a message in an antique bottle. Copper, seashells, glass, found objects. 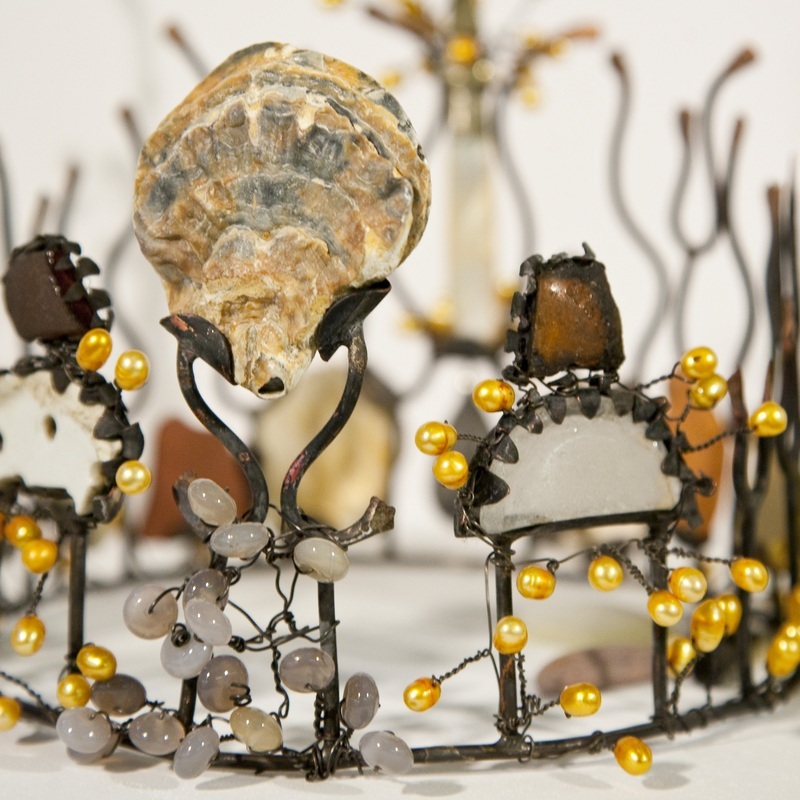 The first mermaid’s crown is that of an elderly mermaid: based upon images of Queen Mary’s tiara, this uses the style of construction more suited to the Edwardian age. It is staid, formal and symmetrical; the materials used are worn and faded, the colours, muted tones of rust, with yellowed pearls. The opera gloves complete this illusion. The antique bottle contains this mermaid’s last will and testament. It simply states “and to you, I leave my 21” colour television”. The second crown by contrast, denotes a much younger mermaid. The construction is informal, feminine, and sparkly, though shoddily made. 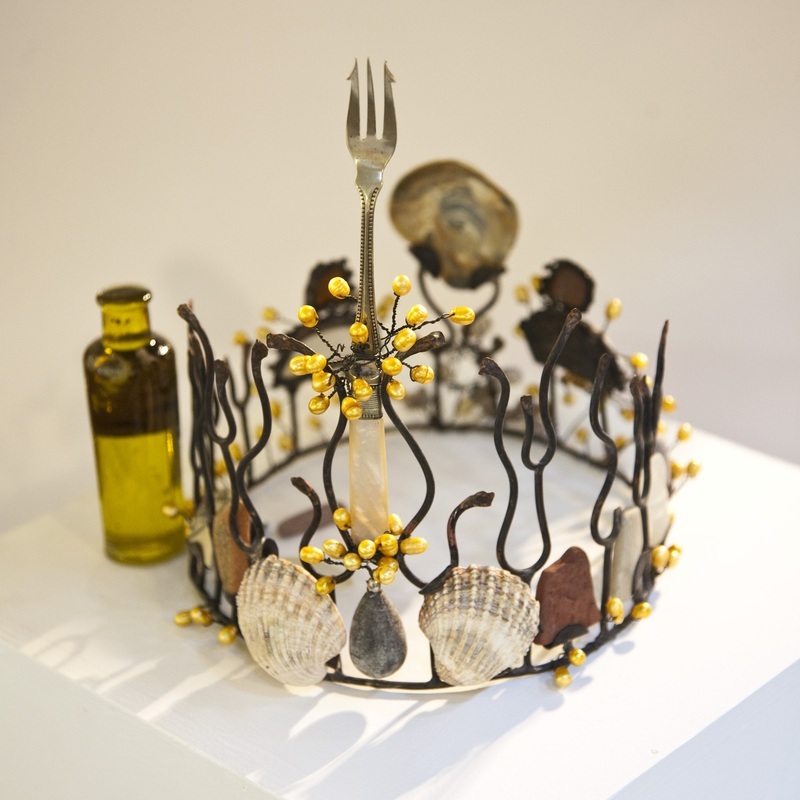 Both crowns use recognisable detritus as part of their construction – for example, a three pronged mother of pearl handled antique pickle fork is the centrepiece of the first crown.....it’s been turned into a triton by this rather grand mermaids’ personal jewellers. Rubbish has a re-use value, and the earth and sea can afford this. Not all waste is a bad thing, but an overload is out of our price range, as a planet. The two pieces stand upon an illuminated plinth. Distorted and unreadable imagery of a substance known as ‘mermaids’ tears’ (*) are displayed in moving form down fibre optics so that the two pieces are gently and beautifully bathed in a seductive glow.......whilst the unseen damage goes unnoticed. And the lust for useless ephemera fills and endlessly re-fills the pockets of a market place that can neither be sated, nor saturated. (*) Mermaids’ tears are pieces of industrial waste plastic that vary in size; larger chunks, down to grains of almost invisible dust. This substance is visible on land, but is also choking the seas. The oceans are being choked by a substance called ‘mermaids tears’. These tiny pieces of plastic are the ground up debris of our greedy consumerism.....the dust that settles over our faded dreams and aspirations. A 21 inch colour TV: we all lusted after one. I was proud of mine – the instrument through which I was fed all the other desires the industrialists wanted me to want. And I wanted them until, like a greedy child, I wanted something else. I ‘recycled’ it. I did no such thing! I left it in a compound in Abergele skip, and salved my conscience that it would be ‘harvested for parts’. How greedy. How futile. How extinct. 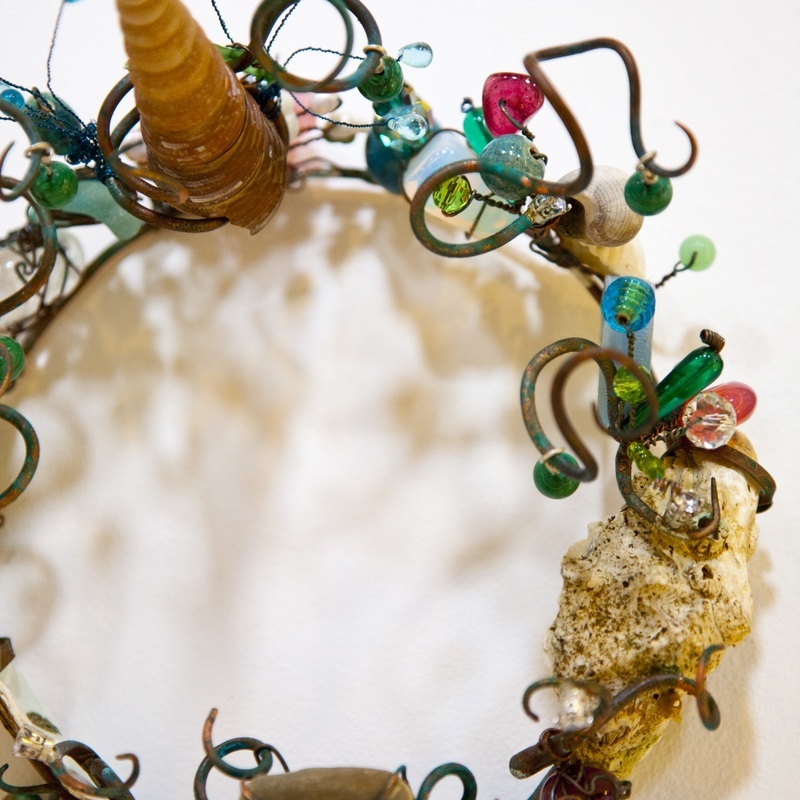 The mermaid’s crowns were made out of copper brazing rods, and found objects. I prefer to work without sketches. I have a strong visual idea in my head as to what it is I’m setting out to do, but the process is also dictated by the objects I find on my workbench. I have always been a hoarder and collector, even as a very small child. Drawn to the sea my whole life long, a vast collection of beach-combings has now accumulated, and (a very small proportion) was put to good use on this project. The crowns were a delight to make! 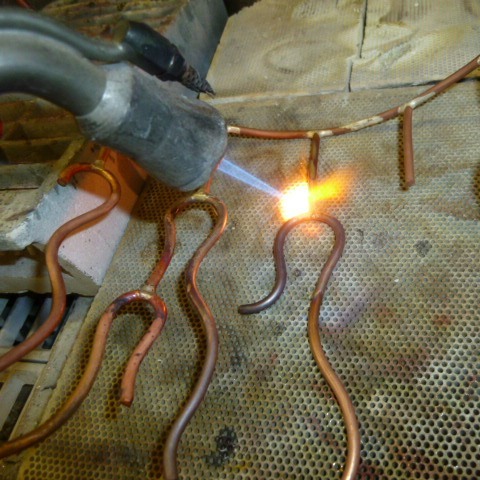 This photo shows the process of soldering together one of the ‘U’ shaped pieces. I use silver solder (hard solder) to attach; the join is stronger than the base metal itself. I intended to blacken the finished copper, before hammering out the ends. I wanted the piece to look as if it had been made out of seaweed. 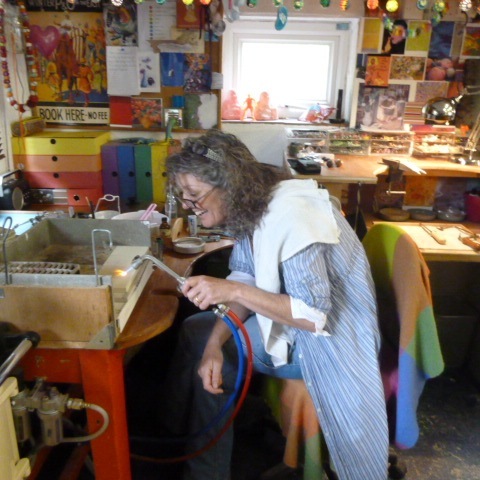 A happy Clarrie in the corner of her workshop with her jewellery bench – and a small blowtorch. The Blue Earthworm is fully equipped with two hearths, ample working space, and as many hammers and anvils as a woman could need. 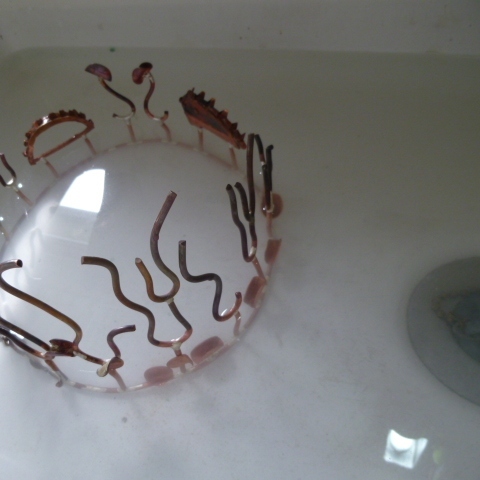 Once the metal has been soldered, using the blowtorch, it’s quenched in cold water. The shape of the crown is coming together nicely. It will be placed in the acid bath to clean the metal, and a fresh section prepared for the next joint. 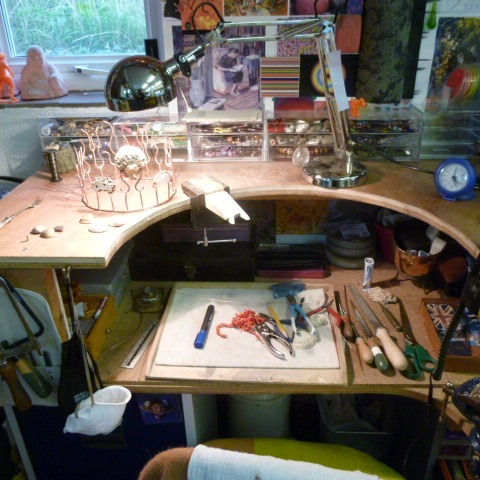 Between soldering the upright sections on, the piece is taken to the jeweller’s workbench to be filed and smoothed back. This is where the decision making process happens, amongst all the collected clutter! 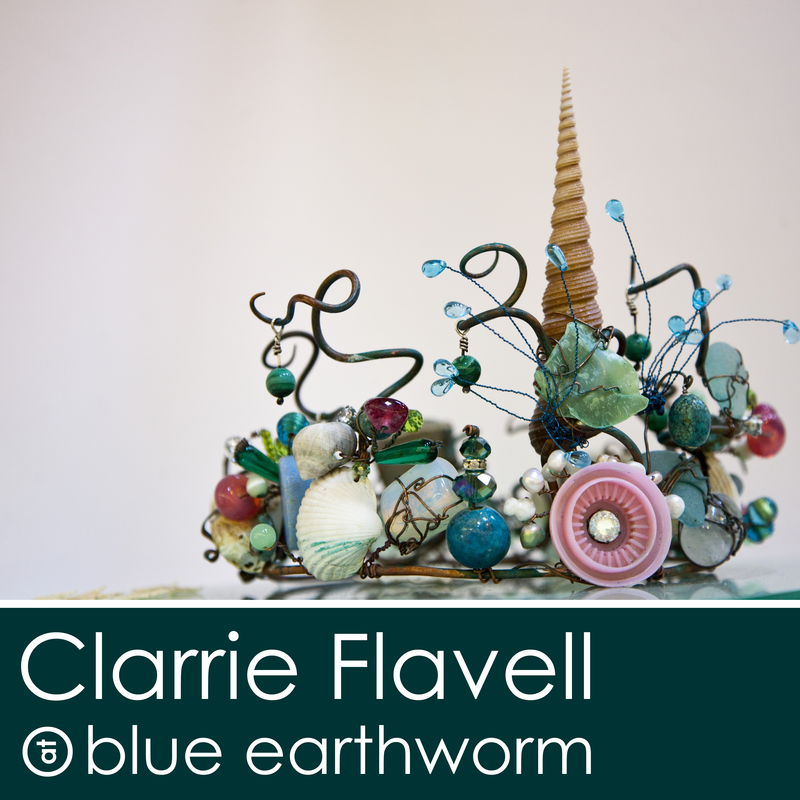 A small piece of shell, driftwood or glass can be tried out for size against the progressing crown – this one was worked ‘live’ without sketches. This is because it gives the freedom for alterations to be made. With found objects, it can be difficult to dictate a formal design using pieces that may have to be replaced during making. Some of the more fragile finds do not survive the process. They are often irreplaceable.